ITS ALMOST SUMMER!! So ladies its time to put some new pieces into your wardrobe. I am doing a post on my top 10 River Island picks for you guys this summer. It's quite different and not what you would stereotype as summery but I adore all 10 of these pieces and they will definitely be jazzing up your wardrobe! 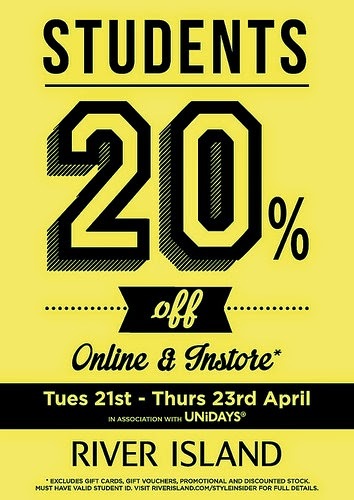 If you are a student you get 20% off until tomorrow (23rd April 2015) so do some online shopping tonight and see if there is anything that takes your fancy! Every girl deserves to treat herself every once in a while, and I am so glad to be pairing up with River Island to give to you my top picks. It's great as they're so affordable yet so trend-driven, hence why they have been one of my favourite High-Street stores for years! Personally, I am on a hunt to ensure all of these 10 pieces are mine!! (I'm such a shopaholic). So, do some guilt free shopping this evening with 20% off (scroll to banner below). Click on the links below to find the item on their website!